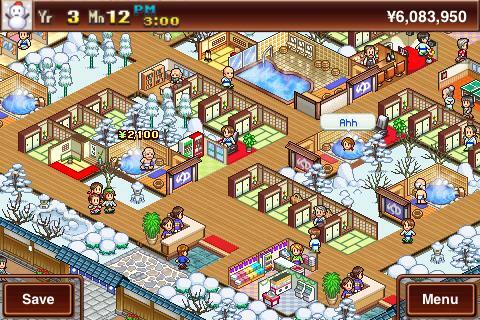 I am addicted to an onsen simulation game. There are pretty much no words for how pathetic this is. 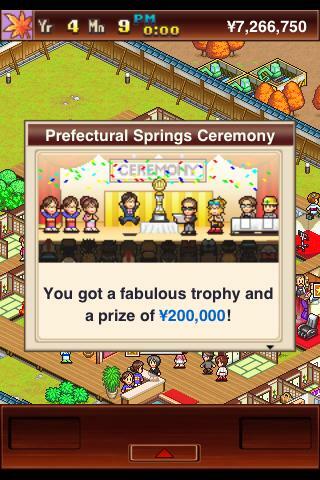 About a year ago I downloaded Kairosoft's Hot Springs Story, the English translation, for my smartphone. The premise of the game is simple: You are the owner of a brand-new hot spring resort, and you must construct and expand a spa good enough to draw thousands of visitors from all walks of life. You're given a budget and a small selection of rooms and services to start out with, then let loose on the property. The free version lets you play one in-game year, and I liked it enough to buy the full game after that. Sim games have never been a particularly big passion of mine (though as of late I've developed an infatuation with Tiny Tower as well) but the idea of building my own onsen hooked me, as I'm sort of a hot spring nut. I was thrilled to see the tiny pixelated tatami rooms and baths. I got my resort started, and from then on I was playing day and night; in the car, at work, at home, in bed. Eventually I beat the game, but I could not complete the final challenge - earning the approval of Chimpan-Z to unlock the giant ofuro, as seen in the image above. I just could not get Chimpan-Z to like my resort enough, and after dozens of tries, I let the game sit unfinished. Recently, though, when I got the Amazon Kindle Fire for my birthday, I thought I'd see if Hot Springs Story would work on it. The idea of playing it on a larger screen was very enticing. Unfortunately, the full version of the game isn't available on the Amazon Marketplace yet, but I did end up starting a fresh game on my phone...and immediately falling into the exact same trap of playing it for hours and hours on end. I can't seem to get enough of this game! The spritework is just fantastic, and I love the changing of the seasons and the seemingly-infinite types of guests who show up at my resort. The concept is so uniquely Japanese - and playing Hot Springs Story slightly offsets how much I miss the real thing right now. It can be a slow-paced game and frustrating at times (you would not believe how much trouble I had getting a beautician to open up shop for me) but is actually even more fun on the second go-around. If you have an iPhone or Android, you definitely want to give this one a try! Glancing at Kairosoft's page, it would seem they have a bunch of similar games as well - Pocket Academy and Oh! Edo Towns both look really interesting. 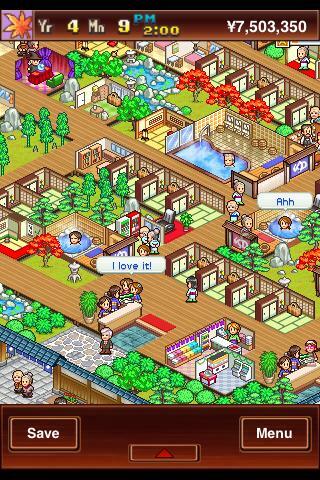 There's a brand-new Kairosoft game in the Google Play Store for Android, as well, called The Sushi Spinnery. It looks so adorable that I cannot resist going to check it out immediately. ...Yeah, Kairosoft games are definitely a trap. Beware! But go check out Hot Springs Story, of course!